Car hire terms and conditions will differ from country to country and from supplier to supplier, and vehicle to vehicle, always consult the specific Rental Conditions relating to your rental quotation. 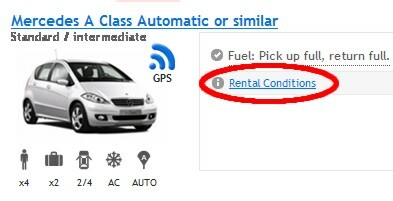 On the quotation page of our booking process you can find the rental conditions by clicking on the link Rental Conditions. These conditions will apply specifically to the car you select. We provide quotes for car hire at Airport Terminals Downtown City Centre, Bus Stations, Train Stations and Hotels in all major cities worldwide. Choose the cheapest cars available from leading companies such as Hertz, Avis, Alamo, Budget Dollar, National Sixt, Thrifty Europcar Crown and many more. They each place their best prices on our network, we compare them and only display the best deals to you. Cross border and one way rentals available get a quote now. This waives the renter's liability for damage caused only to the hired vehicle if it is involved in a collision. This waiver carries a excess/deductible or liability of a certain amount. For example; in France it starts from € 450 upward depending on the type of vehicle. This waiver often excludes tyres, glass (windows etc) & towing depending on the Country of rental. Liability Insurance also known as Third Party Insurance. This is the very minimum insurance you need by law in most countries to drive. It covers the renter’s liability for any damage caused to other people or other people’s property. It is generally caped or limited to a maximum of € 1,000,000.00. This is very limited insurance which may have an excess depending on which country you are driving in. If you cancel 24 hours prior to your pick up, you will be refunded in full. Manage Booking Airport Car Hires will not accept cancellations by telephone. Your written cancellation request notice must be received within a minimum of 24 hours in advance of the start date of the rental. Should your rental be a no-show (i.e. you did not collect the vehicle and did not follow our cancellation procedure), all monies transacted on the supplied credit/debit card shall be retained. Airport Car Hires have sourced the best fully inclusive rental rates from the worlds top 100 approved car rental companies; both local and international. We shop around for the best rates for you. That is why we offer a simple and straight-forward price promise to all our website customers: "If you have a confirmed reservation made via this website and you find a cheaper rate on the Internet for the same type of vehicle, from the same location and with the same conditions; we will refund you the difference between the two rates." As rates can change daily our price promise is offered if you find a cheaper rate within 7 days of your reservation. 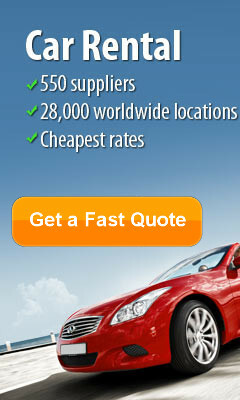 Our price promise refers to rates that can be seen and verified from the Internet. It does not apply to any non-internet offers or offers available to people who hold special discount codes or numbers that are not available to the public. Or Vehicle licensing Fee ( VLF ). It is now common with most rental companies to charge a road fund tax. Some car rentals companies charge for excessive mileage or kilometres to cover accelerated depreciation 99% do not. This wil be clearly stated in the terms and conditions. This waives the renter's liability for theft or attempted theft of the rented vehicle only. This waiver may carry an excess/deductible or liability depending on the vehicle and country of rental.